Mike reported yesterday that Activate, the Tory ‘grassroots’ campaign, that isn’t connected at all to the Tory party, except for what it says about working to get Tories elected and defining itself in its constitution as a Conservative organization, found itself mired in controversy over its members’ conversation on WhatsApp, in which they expressed some very unpleasant comments about ‘chavs’. It was, as one of those involved dimly began to realise, Nazi stuff. They were talking about sterilizing them, gassing them, and turning the Isle of Wight into a giant prison for them. As well as using them for medical experimentation. Activate splutteringly denied that they were responsible for all this Nazi hate speech, claiming instead that they were hacked. It’s a convenient excuse which doesn’t ring true, as someone else had appeared on their page after the conversation telling them that they should be careful what they say. It’s now been revealed that all the ‘Nazi chat’ really did come from members of Activate, as their membership director, Fizarn Adris, had a Twitter feed which showed a very unpleasant attitude to the poor and vulnerable. This has now conveniently been taken down. I am not remotely surprised that members of a Tory support group have such a deep hatred and contempt for the poor and marginalized. And I admit that I’ve made some of the same comments myself about the criminal members of the underclass. A friend of mine used to work in a very rough area in Cheltenham. Don’t be surprised – they do exist. She and her colleagues had been threatened several times at work, and gangs had also tried to break in and rob the place by people, who could fairly be described as ‘chavs’. The Activate members’ gloating descriptions about what they’d like done to the desperately poor, however, is just pure Tory class prejudice. It comes across as the stupid sneering of upper class public schoolboys and girls, smugly convinced of their own superiority as members of the privileged class, with a bullying attitude to those beneath them. Oh, isn’t it great fun to give the lower orders a good bashing, even if it’s only in the form of tasteless jokes. It comes from the same mindset that produced the Assassin’s Club in the 1980s. That was a group of public schoolboys at Oxford, who used to pay restauranteurs so they could come in and wreck the place. And I’m not remotely surprised that the jokes being made involved the same treatment that the Nazis inflicted upon Jews and other persecuted groups, including the disabled. There’s a section of the Tory right which has always overlapped and sympathized with the Fascist fringe, despite their denials and the attempts by Thatcher and her successors to quash all mention of it. Some of us can remember the antics of the various Tory youth movements in the 1980s, like the Union of Conservative Students. This bunch of upper class charmless nurks, to use Norman Stanley Fletcher’s descriptive epithet, used to run around singing such inoffensive ditties as ‘We Don’t Want No Blacks or Asians’, to the tune of Pink Floyd’s Another Brick in the Wall. As well as ‘Hang Nelson Mandela’. I also remember how the leader of one of these Tory youth outfits in Northern Ireland was also something of a racist, although he sort of denied it. Very sort of. In fact, if I recall correctly, he issued a statement which said, ‘We are not Fascists. We are Thatcherite achievers. But if Mrs. Thatcher won’t have us, then we will go to the Far Right’. Which, like Trump’s condemnation of the Nazis who goosestepped in Charlottesville two weeks ago, really isn’t a denial at all. As for the Union of Conservative Students, from what I recall, it was just so riddled with overt, unapologetic racism, that Tory Central Office closed it down and merged it, along with the Young Conservatives, into a new organization, Conservative Future. Since the 1980s, racism, or at least very open displays of it, have become much less acceptable in British society, quite apart from the legislation in place to protect ethnic minorities from prejudice, intimidation and violence. And the Tories have tried to weed out, or at least be seen to be weeding out, the Nazis in their midst. In the 1970s the Monday Club opened its membership books to the Board of Deputies of British Jews to show that they didn’t have anti-Semites amongst their membership. However, the organization still remained so extremely anti-immigrant that in the early part of this century Cameron and IDS severed the Tory party’s links with them because of their racism. So the upper class members of Tory support organisations have found that they can’t be as racist as they were back in the 1980s. But they still have the urge to punch downwards, to mock and sneer at the underprivileged. And so instead of joking about abusing and deporting ethnic minorities, they’ve gone on to making Nazi comments about maltreating and exterminating chavs. Which is supposed to be quite acceptable, because they’re white, and so this doesn’t count as racist abuse. Not that there’s anything much different in their attitude towards the poor here. Keith Joseph, Maggie’s mentor, caused a storm of outrage in the 1970s when he expressed a similar eugenicist, Nazi attitude in a speech in which he attacked unmarried mothers as a threat to ‘our stock’. The jokes Activate’s members were making about killing, sterilizing and experimenting on members of the underclass are disgusting and offensive. But there’s nothing remotely new in their attitude, or in what this has revealed about part of the Tories’ constituency. It’s always included sneering members of the upper classes, with a chilling contempt for those they see as the inferiors. They only difference now is wider society finds this more offensive than it did, and they’re expressing their vile views on social media, rather than on the rostrums at party conferences. With the allegations over supposed anti-Semitism in the Labour party, let’s not forget that the Tories also have a long history of racism, including the various organisations of which Cameron and at least one of his cabinet colleagues were a part. I’ve reblogged the timeline of vicious xenophobic prejudice put up by Tom Pride in the history of the Daily Mail. A few years ago Mike put up a piece attacking Cameron’s hypocrisy sending his condolences and eulogies for Nelson Mandela at the great man’s death. Cameron was a member of the Federation of Conservative Students in the 1980s, at the time when Thatcher was loudly proclaiming that she was not going to impose sanctions on apartheid South Africa, and denounced the ANC as terrorists. Her views were enthusiastically shared by the Tories’ youth wing, many of whose members used to sing ‘Hang Nelson Mandela’. A few years ago, just after the Tory/ Lib-Dem coalition government weren’t elected, Cameron appointed another former member of the Federation of Conservative Students to a cabinet post. I’m afraid I’ve forgotten the precise details, by Private Eye ran a piece pointing out that the gentleman in question was a Conservative student at Loughborough when the Federation of Conservative Students was very much dominated by the hard Right. The Federation became infamous after a scandal surrounding its members’ behaviour at a Federation conference organised at the Uni. The Eye stated that Tory Wets were terrorised and attendees left excrement in the showers. They were also notorious for singing ‘We Don’t Want No Blacks and Asians’ to the turn of Pink Floyd’s ‘Another Brick in the Wall’. After further hard-Right antics like this from other parts of the Federation, Tory Central Office finally lost patience, and the Federation was closed down and merged with the Young Conservatives to form Conservative Future. But this obviously didn’t stop Cameron from choosing one of his fellow stormtroopers from those heady days to serve in his cabinet. One of the issues that comes up regularly is the question of BBC bias. In actual fact, there doesn’t seem to be much question there. BBC News is very biased against the left and in favour of the Tories. There have been studies done by media monitoring organisations in Glasgow, Edinburgh and elsewhere. Mike over at Vox Political has pointed out that the Beeb will ignore certain strikes, or grudgingly give them coverage only online. There was anger the other week when the panel on Question Time was nearly all composed of right-wingers. Nick Robinson censored and distorted one of Alex Salmond’s speeches during the Scots independence campaign to make it appear he didn’t answer a question when he did. Robinson was the former head of the Young Conservatives at Manchester University. And Laura Kuenssberg doesn’t really bother writing her own material any more. She just recycles press releases from Tory central office. But ’twas ever thus. One of the commenters on this blog pointed out that the Beeb ran government propaganda against the strikers during the General Strike. Yet still the right jumps up and down ranting about ‘liberal’ bias at the BBC. There are liberal voices there, but they’re increasingly kept away from the main news and comment. Kampfner in his book Freedom for Sale: How We Made Money and Lost Our Liberty describes the development elsewhere in the world of similar political bias and censorship in television. He looks at the way Sarkozy in France and Berlusconi in Italy both overtly sought to extend state control over television in order to suppress or censor unfavourable broadcasting. In the case of Sarkozy, the centre-right president passed a series of legislation in 2009 which reinforced government control over publicly owned television stations. This was aimed at phasing out commercial advertising, which would be replaced by government funding. Kampfner states that this made French television dependent on the goodwill of the central government. He also removed the responsibility for nominating the Chief Executive of France Televisions, and instead made it one of the powers of the presidency. He also ensure that the contract could be severed at any time, and the CEO dismissed. (p. 181). It’s not hard to see parallels between this and the way the government has continually exerted pressure on the BBC. I can remember John Major’s administration threatening the Beeb with cuts in the licence fee, or refusing to raise the licence fee to extent desired by the broadcaster. The Tories have also made noises about not renewing the Corporation’s charter, and privatising it, either wholly or in part. The most extreme example of state political control of television in Europe outside Putin’s Russia and the former Soviet bloc is probably Berlusconi in Italy. Kampfner states that Berlo not only owned the major private broadcasters, but also very strictly controlled state television. Editors and managers, who refused to toe his line were removed from their posts after the diminutive Duce had a few words with the board. Those TV shows he didn’t like, or which criticised him, were taken off the air. One of the most notorious of these was the satirical show, Raiot, shown late nights on Rai Tre, Italian TV’s third channel. This directly lampooned Berlo himself, and so not only did the vain squadristo with the dodgy hair implants have it pulled from television, his private TV station, Mediaset, sued. Sabina Guzzanti, the show’s writer, made a film about this debacle, entitled Viva Zapatero. This became a surprise hit and the Cannes Film Festival It’s title is not just a homage to the film, Viva Zapata, but also a tribute to the Spanish centre-left president, Jose Zapatero, who removed the right to nominate the head of the state television authority from presidential control. Censorship and political bias at the Beeb long predates the modern, insistent Tory bias, but it seems to be a part of the increasing right-wing authoritarianism across Europe, a process that needs to be tackled before free speech is gradually snuffed out across the continent. I found this English language interview from 2008 with Guzzanti, where she talks a bit about the Raiot incident, and her forthcoming movie, Sympathy for the Lobster. Influenced by Jean-Luc Godard’s film about the Rolling Stones, she says that this movie is about what happens when you want to change society politically, but can’t because politics is too corrupt. She also mentions that she has two more films in production, one on satirists and censorship, and another which was to be a straightforward documentary on Italian society. If you can speak Italian or Spanish, here’s the trailer for the film Viva Zapatero itself. It’s in Italian, with Spanish subtitles. There are piece of English. This includes a sketch she did as Berlusconi with our own Rory Bremner as Tony Bliar, and a Spitting Image-like puppet sequence where Dubya and the other leaders sing ‘We fight the world’. Oh yes, and at one point two of the characters from Pulp Fiction leap out and shoot Berlusconi. The pro-Tory bias at the BBC becomes every more blatant. Mike over at Vox Political has this story, http://voxpoliticalonline.com/2016/01/15/bbc-question-times-right-wing-panel-sparks-anger-from-viewers-and-labour-mps/ about a report in the Mirror that the bias in the selection of the panel on Question Time was so right-wing that the Beeb has received a storm of criticism from the public, and the leader of the Labour Party, Jeremy Corbyn. The Labour MP, Cat Smith, was the only left-wing member of the panel. The others were a Tory cabinet member, someone from UKIP, and two journos from the Murdoch press. So no bias there, then! It’s interesting reading the comments to this post as well. Most are from people, who stopped watching it because of the right-wing bias. The last time I blogged about the Beeb’s bias, I received some very interesting comments, which added further information and background to this issue. All good points – but you could also mention the salient fact that the political editor at the BBC is a former head of the Young Conservatives and was first accused of bias (over and above the BBC norms) as early as 1995; when he was working on Panorama. Further information was added by the commenters over on Mike’s blog, who posted their response to his reblogging of my article on the Corporation’s bias. I know this is convoluted, and slightly incestuous, but the comments are worth repeating here. The BBC was founded by Lord Reith in 1922 and immediately used as a propaganda weapon for the Baldwin government during the General Strike, when it was known by workers as the “British Falsehood Corporation”. During the strike, no representative of organised labour was allowed to be heard on the BBC. Ramsay McDonald, the leader of the opposition, was also banned. In 2003, a Cardiff University report found that the BBC ‘displayed the most “pro-war” agenda of any broadcaster’ on the Iraq invasion. Over the three weeks of the initial conflict, 11% of the sources quoted by the BBC were of coalition government or military origin, the highest proportion of all the main television broadcasters. The BBC was less likely than Sky, ITV or Channel 4 News to use independent sources, who also tended to be the most sceptical. The BBC also placed least emphasis on Iraqi casualties, which were mentioned in 22% of its stories about the Iraqi people, and it was least likely to report on Iraqi opposition to the invasion. Joan Edington also commented on their bias towards privatised hospitals, and against Scots Independence. It’s taken a long time for a lot of people to realise this bias. So many simply refused to believe that the good old BBC could be anything but impartial. Sadly, it has been obvious to me, and anyone who pays attention to the detail of news, that it has been getting worse for several years. I first really noticed it in 2012 when the Welfare Reform Act came into play. There were interviews with patients at new PPI hospitals saying what wonderful treatment they had, while similar interviews of patients at traditional NHS hospitals always highlighted the negatives. Up to this point I was ALMOST giving the benefit of the doubt about bias, thinking that maybe it was because they had sacked so many journalists that they could no longer carry out their own research. However, since then, virtually all reports have claimed an event as true rather than saying “according to the government”. This is no more than propaganda. The final nails in the coffin, to me and many Scots, was their blatant backing of Better Together during the Scottish Referendum in 2014 and a totally discredited “Scottish Labour” during the GE in May 2015. Mind you, these were probably not noticed by 90% of the UK population. I am extremely sad about this situation since the BBC does make some very good programmes. It’s sports coverage used to be by far the best, back in the days before it had to compete with the money available to the commercial channels. It seems that we are to lose all that, simply because their once trusted and respected News Department can no longer lives up to that title. My guess is that the BBC behaves with this bias because it is the British Broadcasting Corporation. It is the official, established state broadcaster, and so represents the views of the Establishment. It is supposedly impartial, and my guess is that many of its staff genuinely believe they are, but as the official state broadcaster the establishment bias is at the very core of its ethos and raison d’etre. Hence the Tory party political bias, and the pro-War agenda. The upper classes have always been the backbone of the armed forces, ever since the feudal warriors of the Middle Ages. And the war in the Middle East is being ostensibly waged to protect Britain and defend and export her values of democracy and civil government. The opposite is true, of course. It’s done to for the interests of multinational industry, and the freedom of western capitalism to steal and exploit the resources of the Middle East. And so when the Beeb decides that its going to discuss the contemporary war on terror, it all becomes very establishment and official. Mike over at his blog has frequently discussed the repeated misreporting and, indeed, deliberate censorship of left-wing demonstrations against the government by the BBC and the other mainstream broadcasters. Apart from the usual tactic of deliberately giving the number of protestors as smaller than there were in reality, the BBC has also totally omitted several major demonstrations against the government from its television news. Instead, some minimal coverage was grudgingly given to them on the radio and on-line. Several of Mike’s readers and commenters, including Mike himself, have complained about this. They’ve been brushed off with a standard reply about the limited amount of space available, and the necessity of skipping or omitting some items in favour of more important news. The Beeb has then smugly declared that it’s duly investigated the case, and found that everything was done properly and appropriately. So that’s alright then, as Private Eye says when an organisation or authority guilty of misconduct similarly exonerates itself by giving the exact same reply. The debates over Scottish independence, leading up to the referendum last Thursday, threw the BBC’s pro-government bias into sharp relief. The Corporation’s reporter, Nick Robinson, selectively edited and then completely falsified his report on a question he asked Scotland’s then First Minister about the possible damage independence might have to the nation’s finances. This was then edited by the Beeb to claim that the First Minister had attacked the treasury. Robinson stated that several of the banks and insurance companies, like the Royal Bank of Scotland, had stated that in the event of Scotland gaining its independence, they would move their headquarters from Edinburgh to London. This would, suggested Robinson, lead to a massive loss of corporation tax for the Scottish government. Salmond disagreed. He gave the opinion of other leading financiers north of the border that there would be no significant loss of tax revenue, as corporation tax was paid in the country where there a corporation had most of its economic activity, not where it had its headquarters. The banks and other financial institutions may move south to London, but they would still end up paying the same amount of corporation tax. I noticed that the I newspaper made a similar claim. I also wondered how the Royal Bank of Scotland could possibly continue under its name, if it very unpatriotically pulled out of its home country. This, however, was not the answer Robinson wanted. When Salmond moved on to answer questions from the other reporters present, Robinson heckled and continued to demand an answer from Salmond. Salmond returned to the point, gave a full answer, and pointedly stated that he knew the BBC would report it in its scrupulously unbiased reporting. He then tried to move on to questions from the foreign press. This wasn’t good enough for Robinson, who asked the same question, and got the same answer. When the BBC reported Robinson’s question and Salmond’s reply, they selectively edited the footage so that it looked like Salmond was attacking the British treasury, and praising the BBC. In fact, as the original footage makes clear, Salmond had been making a veiled criticism of the quality of the BBC’s reporting. Later still, on Newsnight, Robinson claimed that Salmond had not answered his question at all: a bare-faced lie. As you might expect, Scottish Nationalists are massively unimpressed with this blatant falsification by the BBC, and there are several videos about it on Youtube. Here are two I found that make the case particularly well. This video, The BBC Is Killing Democracy, gives footage of what really happened when Robinson asked his question. It then gives Robinson’s own highly selective report, pointing out how it has been altered and edited to present the answer Robinson wanted, rather than the one he got. It then moves on to Robinson’s final report, where he lies and states that Salmond didn’t answer the question. It then concludes with a brief resume of Robinson’s and Salmond’s careers, pointing out that Robinson was first head of the Young Conservatives in Macclesfield, and then national head of the organisation. This video, Dodgy reporting from BBC News Editor – Nick Robinson 11/09/2014 goes further, and gives the relevant passages in the BBC’s charter that demand impartiality, and which the BBC’s reporting of Robinson’s question to Salmond broke. There were protests against the BBC’s biased reporting of the independence campaign outside the BBC’s headquarters in Scotland on the 1st and 29th June 2014. This video below, Protest Against BBC Scotland Referendum Bias shows pro-independence Scots discussing the Beeb’s bias, and their disillusionment with the Corporation. One of the women speaking is actually an English person living in Scotland. She states that she is voting for independence for Scotland because she is worried about the Westminster establishment’s destruction of the NHS and tuition fees. She states her daughter will not be able to afford to go to uni, and the only people that will, will be the elite. Robinson’s deliberate falsification of Salmond’s answer is important far beyond the immediate debate about Scots independence. Regardless of one’s personal opinion of that particular issue, it should concern everyone worried about the Beeb’s pro-establishment bias. It’s clear and undeniable evidence that the Corporation has blatantly lied in order to serve the interests of the Tory Westminster elite. It also shows how Tricky Nick Robinson really is little more than a Corporation apparatchik spouting propaganda, and that the BBC is now well and truly the establishment’s equivalent of Pravda and TASS, the state news agency in the Soviet Union or the various state-controlled newspapers and broadcasters in Nazi Germany and Fascist Italy. 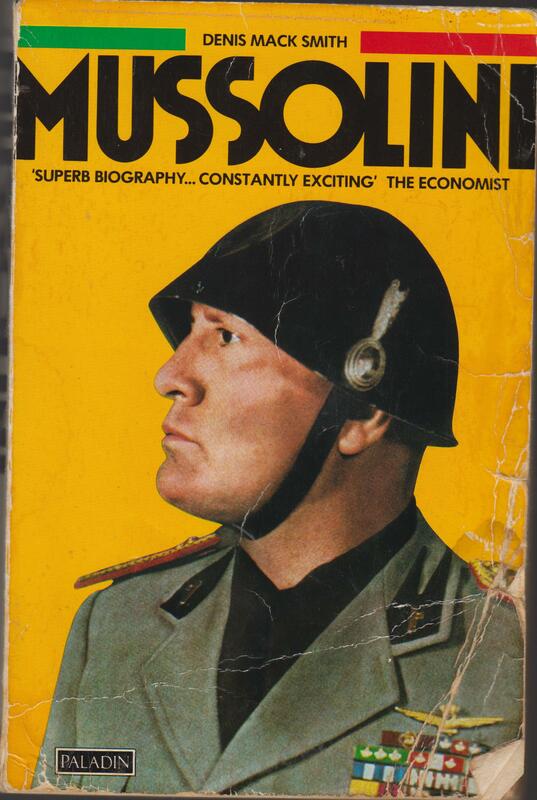 I’ve blogged about how the Italian Fascists and Nazis in Germany consciously appealed to middle class support by posing as the defenders of private industry against Socialism and the organised working class. Mussolini took his elitism partly from the economic doctrines of Vilfredo Pareto, the anti-democratic defender of free trade. He appeared to embrace the middle-class ideology of liberismo, stressing the need for a balanced budget and a stable currency. He also suggested at various times that he would end state unemployment benefit, and allow private involvement in the telephone network and state life insurance. Mike over at Vox Political this morning reports that membership of the Conservative party has fallen below 100,000. This makes them an elitist party, according to Fascist doctrine. Both the Nazis and the Fascists, as opponents of democracy, declared they were not interested in forming mass parties. They thus declared that they were formally limiting membership of the party itself to 100,000. Various subordinate party organisations, such as the Hitler Youth and similar Fascist organisations in Italy had mass membership in order to control the population, and there was mass enrolment in the Fascist and Nazi parties themselves as they attempted to secure and reward the positions of supporters and followers. I think during the Third Reich membership of the Nazi party actually reached 9 million. The fact that the Tories have fallen below the figure chosen by the Nazis and the Fascists as the figure for an effective, anti-democratic party has serious implications for the decline of democracy. It also shows the unpopular, anti-democratic nature of the Tory party itself. They gained power through making a deal with the Tory Democrats, and were elected on a small percentage of the number of people actually entitled to vote. Their privatisation of the NHS, the massive cuts to the welfare state and the continuation of the utilities as a private industry are massively unpopular. 75 per cent of the public do not want the NHS privatised, and roughly the same amount would like to see the railways and electricity renationalised. Yet the Tories continue with further cuts and privatisation, just to make their contempt for the British public absolutely clear. It’s time this elitist Coalition and the mess they have made of this country were gone. 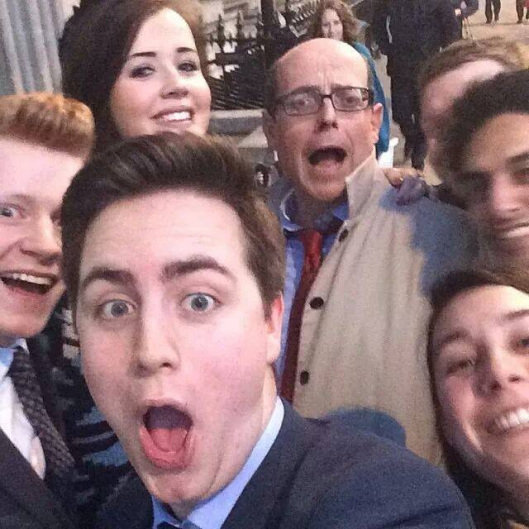 Nick Robinson, former Young Conservatives chairman and current BBC political editor, taking a selfie with some young Tories (Photo courtesy of theblueguerilla.co.uk). Perhaps you’d like to dream up your own caption for this image of wild-eyed, slack-jawed decadence (he’s the political editor at the BBC and people still think it’s left-wing; the mind boggles). -Old Joke told on the Max Headroom Show circa 1986. David Cameron will be touring the flooded areas of south-western England this morning trying to reassure the poor souls there that the government is doing its uttermost to combat the disaster and help the people recover their homes, land and livelihoods that are now drowned under the flood waters. It’s a horrific disaster, as a brief glance at the pictures coming from the affected areas show. In Somerset people have had to be moved out of their houses, while farmer’s have lost crops as the floods covered their fields. 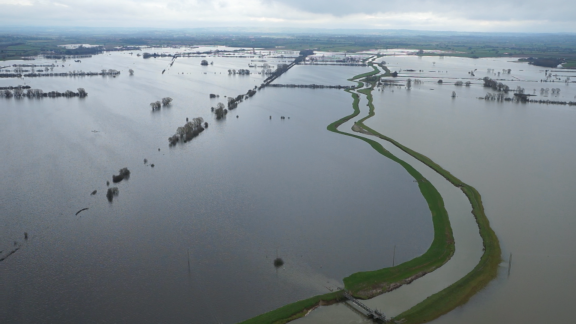 One farmer was faced with the stark choice between selling or giving some of his cattle away, or sending them to be slaughtered as he had nowhere he could keep them, so hard was his farm hit by the floods. During prehistory, and then in the early middle ages the Somerset levels was marshland, and some memory of the extend of the marsh environment is shown in area’s place names. The ‘ey’ in the names of places such as Muchelney, Athelney and so on comes from the Anglo-Saxon ‘ieg’, meaning an island. These villages were islands of dry land in the surrounding marsh. During the Neolithic the local people constructed the Sweet Track, a timber walkway through the marsh supported by poles as a way of getting across the marshy environment. Similar wooden tracks crossing the north German moors were built during the Iron Age. The marshland was gradually reclaimed from the 13th century onwards, though by the end of the 17th century only about a 1/3 of the levels was dry land. The remaining land was reclaimed during the 18th and 19th centuries. Water management and drainage has continued to be vital to the maintenance of the Levels, as the area is criss-crossed by a series of ‘rhines’ and drainage channels, like the King’s Sedgemoor Drain. Historically it has suffered from terrible floods. One in the early 17th century, created through a combination of bad weather and a tidal surge up the Severn Estuary, drowned houses, fields and livestock with the flood waters advancing about eight miles from Glastonbury itself. One eyewitness to this inundation recalled seeing crows perching on floating sheep, until the sheep in their turn sank and drowned. Fortunately the modern floods aren’t that severe, but they’re harmful enough to the people down there, who’ve had to be moved out of their houses. Cameron visited the area yesterday, promising the local people that there would be every effort to combat the floods and that £3 million had been allocated to do this. He also made other, predictable claims that the government was spending more on flood defences than the Labour government. Cameron has been merely the latest in a line of politicians and public figures to come down to look at the disaster and speak to its victims. They included Chris Smith, the environment secretary, and Prince Charles. Smith’s response to the crisis had caused even more anger. The local Tory MP, Ian Liddell-Grainger, was furious at the way the environment agency had handled the disaster. He stated that when the area had suffered flooding a year ago, he spoke to Smith, who promised that suitable action would be taken. Nothing, however, was done. Speaking on the Andrew Marr show, Eric Pickles offered an unconditional apology to the people of Somerset for the way the government had mishandled it. Liddell-Grainger had gone even further, and demanded Smith’s resignation. Smith duly appeared on TV to say he had absolutely no intention of resigning, and was completely satisfied with his Agency’s actions. This had simply infuriated Mr Liddell-Grainger even more, and no doubt contributed to the apology offered by Pickles. Cameron also acknowledged that mistakes had been made. He stated that the Agency had stopped dredging the Levels in the 1990s, and that this was a mistake. Now the floods wreaking havoc throughout the country are a vital issue for Cameron and his administration. Not only are they a national disaster, but the areas affected are of crucial political importance for the Tory party. Like much of rural England, parts of Somerset are a Tory heartland. My parents have joked before now that in some of the villages, there used to be only two social clubs you could join when they were young: the Farmers’ Union and the Young Conservatives. With the Tories now suffering competition from UKIP, Cameron needs to show the Tories’ traditional constituents that he is indeed acting on their behalf. Mixed in the with promises, however, are liberal amounts of the lies, which you can expect from a Tory leader. I’ve reblogged a piece from Mike over at Vox Political, on the way the way the BBC – surprisingly! – picked up the way the Tories had manipulated the graphs showing funding for the Environment Agency to suggest that it was actually much larger than it actually was. As for their claim that the Tories were now spending more on flood defences than Labour, this is may well be true. Now. After the floods had occurred, and demanded immediate action. I doubt very, very much this was the case before though. An administration dedicated to cutting government spending, and which reneged on its promises to preserve the NHS, is hardly likely to have left the Environment Agency untouched. As for Cameron’s acknowledgement that they had stopped dredging in the 1990s, and this was a mistake, this occurred under the last Tory prime minister, John Major. During Major’s administration Private Eye ran a number of stories reporting the way government agencies and watchdogs regulating the environment and the utilities were increasingly downsized, with their powers restricted, in order to give greater freedom to industry. I’ve got a feeling that one of these was almost certainly the Environment Agency or its predecessor. Cameron’s government is similarly dedicated to minimising, if not removing altogether, government regulation and interference, and so I cannot see any long term changes occurring under Cameron. In fact, I can see the complete opposite. After the floods recede, what will probably happen is that, after a brief show of some token of increased funding or activity, the Environment Agency will go back to doing as little as possible as usual. Worse, it will probably be under pressure to cut services further to make savings to make up for the vast amount spent dealing with the floods. So despite Cameron’s grandiose claims, the people currently hit by the floods will be less protected afterwards than they were before. What matters is not that permanent solutions are put in place to tackle the floods and prevent them occurring all over again. What matters is that Cameron is seen to be doing something, so that he can continue to cling to power and make further savings by slashing government expenditure. This is what his paymasters in the multinationals want. And the locals in Somerset, Devon, Dorset and Berkshire will be left to fend for themselves.